The Topsy Turbys released two excellent 45's on Liberty Bell Records, as well as an impossibly rare EP with the two singles combined. 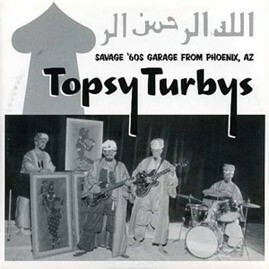 Today, the group is best remembered for the snarling "Hey Tiger" and "Topsy Turby" which both appeared on garage compilations and was covered by San Diego's Tell-Tale Hearts back in the 1980s. The other two tracks have been unavailable since their local Phoenix release in 1965. Sleeve graphic design by Shag with liner notes penned by Topsy Turby member, Charles Johnson.